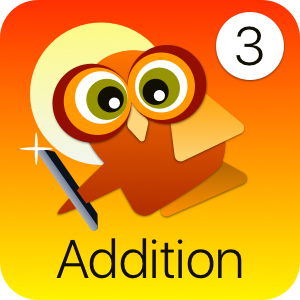 Grade 3 Addition Overview – This 3rd grade math app teaches arithmetic patterns and explains addition using properties of operations. G3A enhances students’ ability to fluently add within 1000 using strategies and algorithms when solving equations and explores two-step word problems. Covers all Common Core Skills required for 3rd grade Addition. The design is fully aligned with the Common Core State Standards Initiative (CCSSI). 3.OA.8 Solve two-step word problems. Write equations with letters representing unknown quantities. Apply mental computation, rounding and estimation strategies to see if answers are reasonable. 3.OA.9 Recognize arithmetic patterns (including simple sequences in the addition and multiplication tables) and explain them applying properties of basic mathematical operations. 3.NBT.2 Add and subtract with ease within 1000 by using the relationship between addition and subtraction and employing strategies based on place value and properties of basic mathematical operations.